Alternate mode: Utahraptor ( Utahraptor ostrommaysorum) -note that in 1994 when this toy was first designed (for Dinobot) the "no feather" look was what scientists thought a raptor looked like! Profile: Grimlock is a battle-tested warrior from before even the Great War. He has seen leaders and comrades come and go. All this experience has lead him to one thing: more aggression towards his enemies. Not trusted by the Maximal Imperium, Grimlock was persuaded, begrudgingly, to adapt by downsizing his robot mode following the Pax Cybertronia. Both the Tripredacus Council and the Maximal Imperium consider him a dangerous loose cannon. 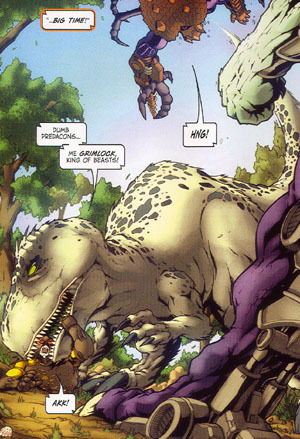 Distrust and inactivity were Grimlock’s greatest enemies, causing him to volunteer for the most dangerous missions. He would choose to be put into stasis on long, uneventful deep space missions because of the cycles of unbearable inactivity. But Grimlock, as always, was prepared for the worst. He was secretly fitted with a personalized reformatting chip designed to seek out only the strongest, deadliest beast modes (extant or extinct) on arrival to any given planet. 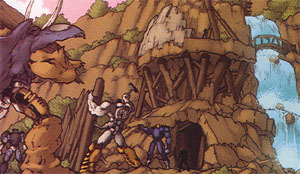 Grimlock was given the duty of going with the Maximals aboard the Axalon to dispose of Protoform X. Not only did Grimlock consider this a babysitting mission, he had serious doubts about the Maximal Imperium’s true intentions. Grimlock fears that the Maximal Imperium is secretly planning to extend their rule through the universe. 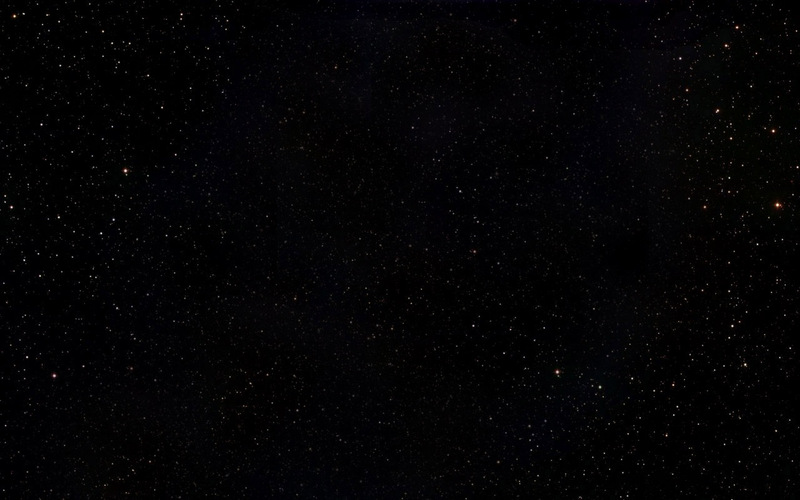 Grimlock accepted this mission with the intent of stopping the Imperium from letting Protoform X loose on unsuspecting planets, then using his presence as an excuse for taking over the planet. Grimlock has aspirations of rebuilding his Dinobots by finding the original members along with other warriors he has met through the years. He is very close to Lio Convoy and believes him to be his one time commander Optimus Prime. 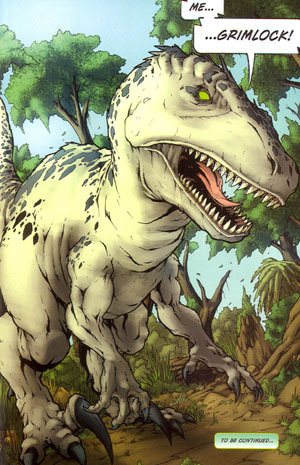 Abilities: Grimlock retains much of his brute strength that he possessed prior to downsizing. He has secondary, reinforced armor plating. He prefers hands-on combat to using his weapons, and he prefers beast mode to robot mode. Grimlock uses his tri-tanium teeth and tungsten tipped claws to rip through his adversaries. He is fast and deadly, possessing acute visual and olfactory senses. Weaknesses: Grimlock is very (some say overly) confident and eager to battle tooth and claw, when he could use weaponry or guile to achieve said victory in battle. But that’s just how he is. In another era when wars were waged between Autobots and Decepticons, Grimlock was a stalwart defender of the heroic Autobot cause. Today, disguised as a vicious velociraptor, Grimlock continues to battle against interstellar tyranny as he fights the evil Predacons. 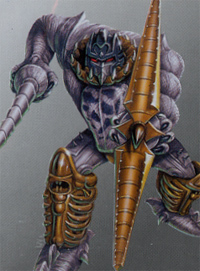 After converting to robot mode, his spinning slasher sword -hidden within his tail slices through the Predacon legions. And when the attack is over, you can usually find him flossing his fangs with the internal wiring of his battle beaten enemies. 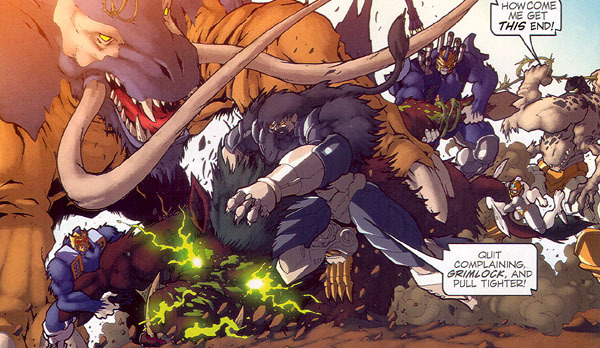 *Beast Wars: The Gathering #3: Arrives to battle Magmatron. 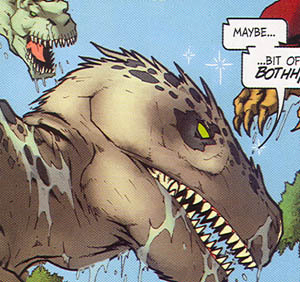 *Beast Wars: The Gathering #4: Battle with Magmatron. 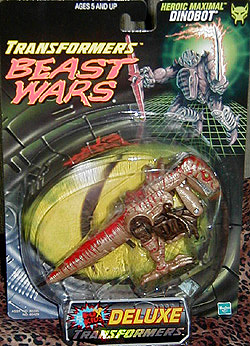 *Beast Wars: The Ascending #1: Stops the attempted infiltration of Manterror, Retrax and Snapper. 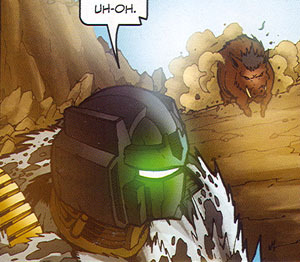 *Beast Wars: The Ascending #3: Goes back to future Cybertron with Lio Convoy. Other appearances: There was the original Dinobot Grimlock, Classic Pretender Grimlock, and Action Master Grimlock. The original was recolored for G2 Grimlock. This Grimlock was (possibly) upgraded to T-Wrecks. The Classics Grimlock released in 2007 comes after G1. An alternate reality version of Classics Grimlock was released as BotCon 2008 “Evil Autobot” Grimlock. Other Grimlocks, which may or may not be connected with this Grimlock, are Robots in Disguise Grimlock, Armada Dinobots Grimlock, Energon Grimlock, Alternators Grimlock, and Animated Grimlock. This mold was used to make Dinobot, Fox Kids Dinobot, 10th Anniversary Dinobot, Beast Wars Second Thrustor, Beast Wars Neo Hardhead, and Beast Machines Dinotron. 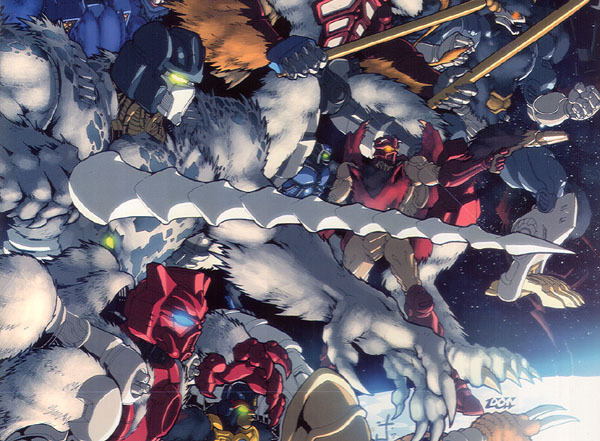 All comic images shown on this page are drawn by Don Figueroa, and published by IDW in Beast Wars, "The Gathering" and "The Ascention." 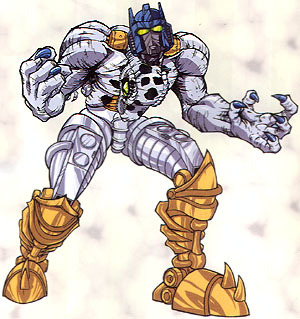 With the lone exception below, is shown an image from the Beast Wars Sourcebook, issue 2 Grimlock in robot mode drawn by Nick Roche.